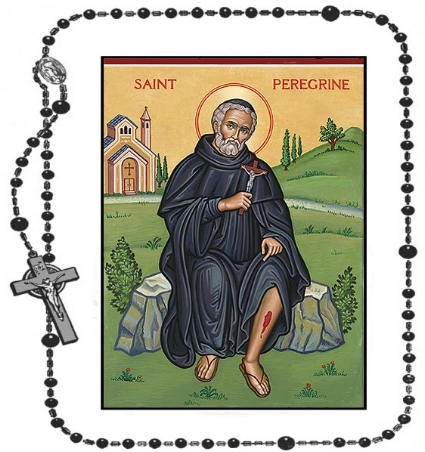 Dear holy servant of God, Saint Peregrine, we pray today for healing. that we will not let sickness bring us to despair. that we may persevere in hope. that we will have the courage to offer up our suffering in unity with the Cross. that the loneliness of our suffering will be consoled. that the fear of death will be replaced with the hope of everlasting life. that our suffering will not rob us of joy. that in our pain we will not become selfish but ever more selfless. that this sickness will teach me to depend more and more on God. that our lives will glorify God alone. We know, Saint Peregrine, that you are a powerful intercessor because your life was completely given to God. We know that in as much as you pray for our healing, you are praying even more for our salvation. A life of holiness like yours is more important that a life free of suffering and disease. Pray for our healing, but pray even more that we might come as close to Our Lord as you are. All Glory be to the Father and to the Son and to the Holy Spirit, as it was in the beginning is now and ever shall be. Amen.